Born and raised on a dairy farm in #Petaluma, this was the landscape for which she first learned how to ride motorcycles. She rode motorcycles out of necessity rather than for pleasure. Her love for riding on two wheels came when she got her first motocross bike and was able to take advantage of having fun on them in the open fields on their ranch. It was here she dreamed of becoming a motorcycle racer. For road racing she only became part of it as a fan watching Petaluma’s Bostrom brothers (Ben and Eric), known by other racers as “The Boz Bros”. She not only idolized them, but Eric became a role model for her when she became part of the same racing team Parker Brammo. In racing sports there is always someone right on your tail trying to beat your personal best. However there are some firsts that no other female will ever take away from Shelina. In this interview you will learn about them and some other things about her you will not find anywhere else. She’s loves her home town and often appreciates it more when she travels. Following is an interview that I conducted with her after recently finishing the LARRs Qatar Superbike Championship in the Middle East to learn more about this amazing young rising star in this fast sport on two wheels. At the conclusion of this interview you will find out about a local camp that she is hosting for young racers, and a recent video interview on Wall Street Journal Live: Shelina Moreda: The Next Danica Patrick on Two Wheels? Wayne: You were recently in the Middle East, was this your first time? Tell us about your experience there. 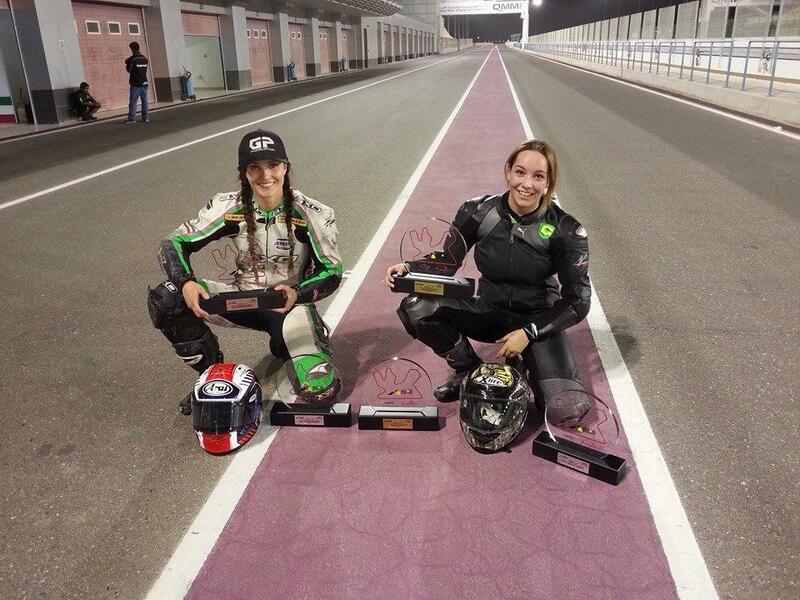 Shelina: I’ve been to Qatar 3 times now for racing, and had never been there before racing. I wasn’t sure what to expect when I was first asked to go there to race for the QMMF Racing Team, but I’m always excited about new adventures, so of course I dove in to this one head first too. Qatar is a huge supporter and promoter of sports, so my experience there reflected that. I am treated so well when I am in Qatar by everyone associated with racing there. I joke and say I feel like a Motorcycle Princess when I’m there, but it’s only partly a joke. I feel like I’m really in my element in Qatar. There is a ton to do before and after the races and I’m always given time to explore. I got to visit the “Old Souq” market and try all kinds of candies and local foods, got to ride quads in the Arabian desert, got to check out their malls and went on a boat ride in their beautiful blue ocean. Even driving around there is interesting, the buildings are all being worked on constantly and it’s a completely different experience than here in the states. I’m all about the experience. Wayne: You recently finished the LARRs Qatar Superbike Championship how was the competition and how did you ride? Shelina: The LAARS Championship is such an honor to be a part of. The Losail track is world class, we get to race at night under the lights and it’s just a spectacular experience for me. Racing at night is my favorite. They invited 5 of the fastest girls from each of 5 different countries to come race against the Qatari guys in the LARRS series and this makes the competition there pretty stiff. I’m proud to be racing against such great competition. For me, starting midway through the season meant I had to catch on quick. My first race weekend was great, my second was a struggle, and by our final round I started to find my groove. I wrapped up the season with 2nd place in one race and a crash out of 2nd in the next, securing 3rd overall in the Championship, with a trophy that I’m extremely proud of. Wayne: I understand this was your first time racing at night, did that make if more challenging? Shelina: I love riding at night, so racing at night is something I’ve wanted to do since I wanted to race. For me I love the ambiance of riding at night. It’s the coolest feeling ever. The lights at Losail are really great, so it’s not hard to see the track or anything. But when you look up at that black Arabian sky… it’s amazing and I could live in that moment for a long long time. It makes it more rewarding, more satisfying.